Spring is officially here!! Today is the first day of spring and I couldn’t be more excited for long sunny days, perfect patio weather and put away my winter coats! Here in Texas, spring is definitely the best time of the year. Its almost as if the California weather migrates a little to the east for several weeks. My favorite thing about spring is definitely the pop of color you start seeing everywhere- from the blooming trees to the colorful outfits its just so bright and vibrant! Today in our home, we are welcoming spring with some bright colorful vegetables. 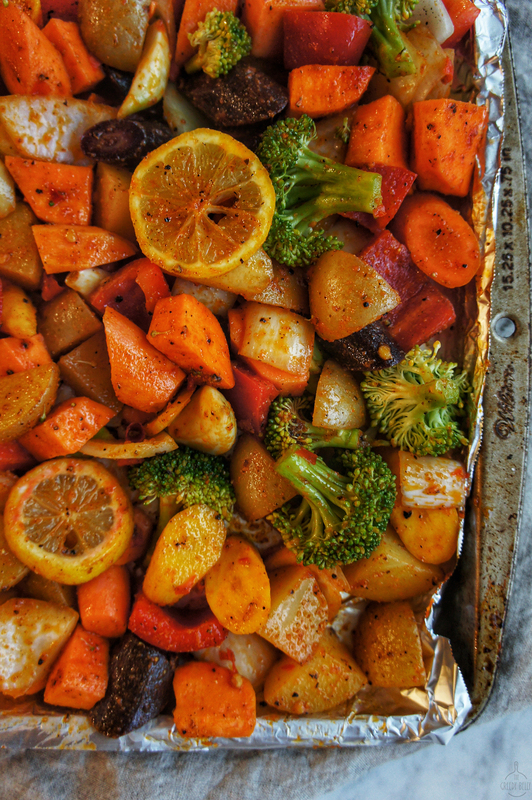 This roasted vegetable dish is a one sheet pan meal, so quick, easy, colorful and delicious! 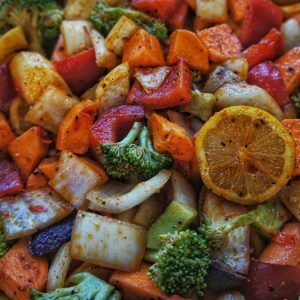 This recipe starts with a variety of bright colorful vegetables, some olive oil, lots of spices and seasonings all mixed together and roasted it in the oven for 30-40 mins. It’s one of the best ways to use up vegetables that have been hanging around in your refrigerator for a while. I usually serve this with my homemade tzatziki sauce. 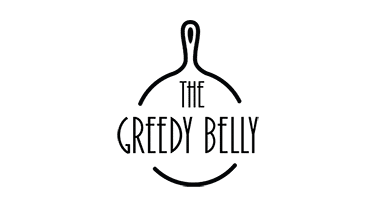 You can find the recipe for that here as well. 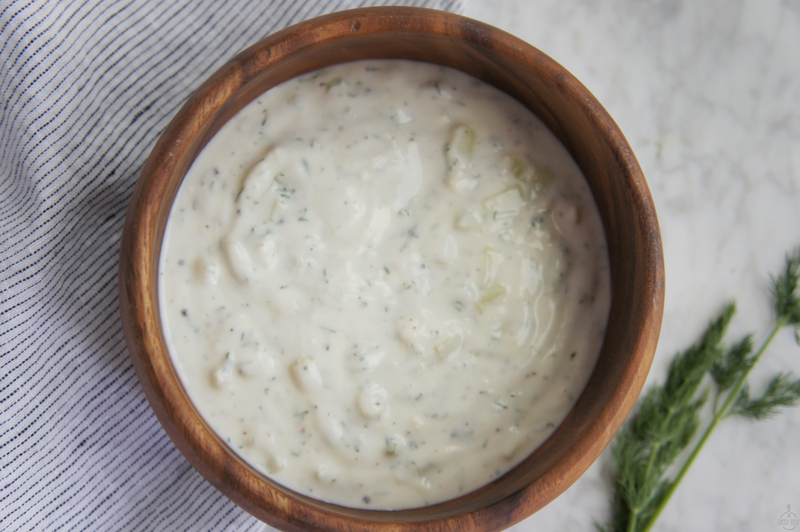 This refreshing Tzatziki is the perfect compliment for the spicy roasted vegetables. Nothing makes me happier than putting together a healthy dinner, within minutes after a long work day. And have minimal cleaning afterwards too. This dish really checks all the boxes! 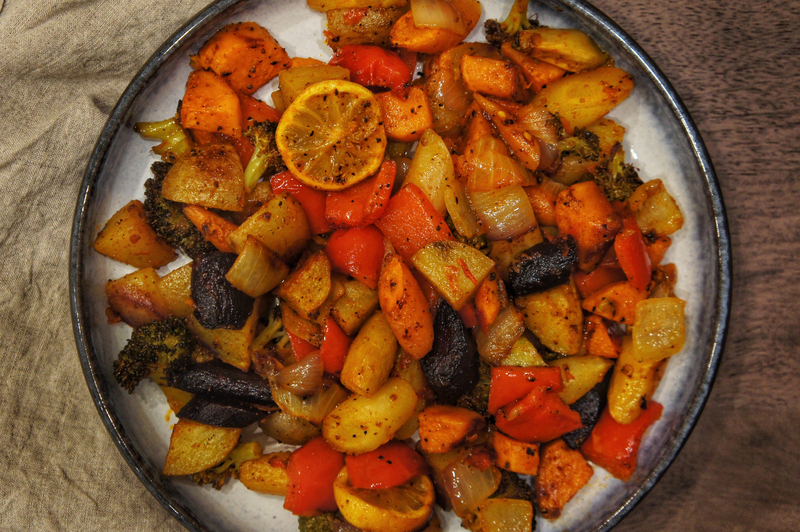 Whether as a side dish, or as the main dish, I’m sure you’re going to love the flavors these veggies bring this spring. Colorful, healthful and with just the right amount of kick. 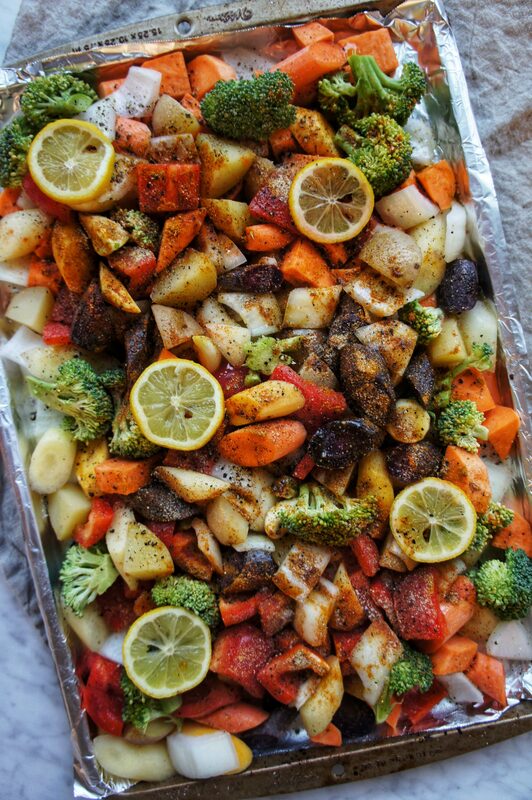 These Moroccan Roasted Vegetables are a one sheet pan meal, perfect for a quick dinner and taste fantastic. Line a baking sheet with foil or parchment paper for easy cleaning afterwards. 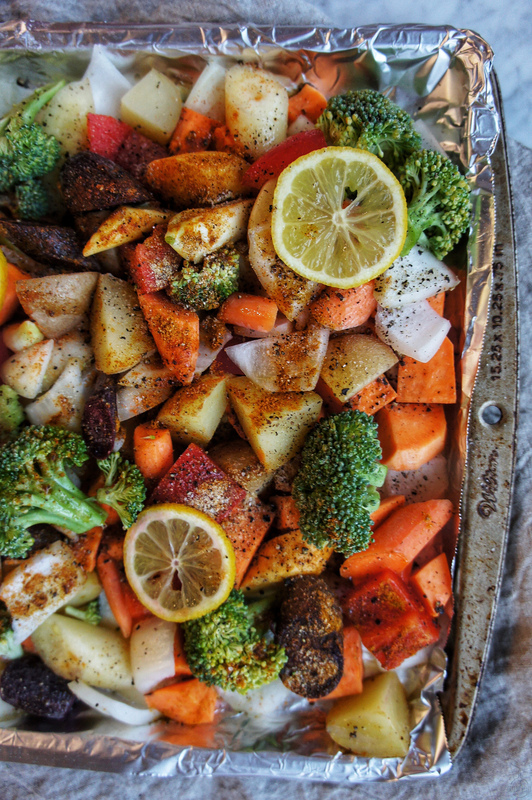 Place all the vegetables on the baking tray. Mix thoroughly so that all the vegetables are well coated. 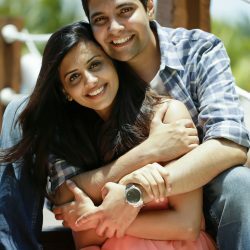 Don't be shy to use your hands! 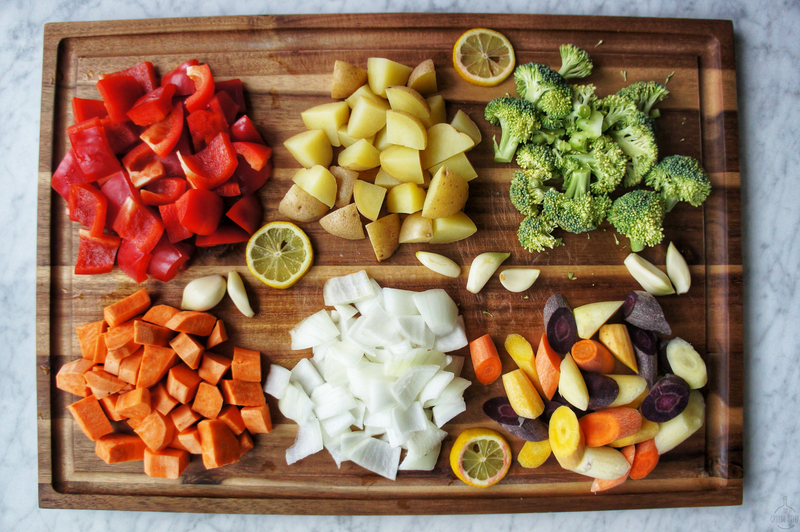 Arrange all the vegetables in an even single layer. Bake in the oven for 20 minutes. Remove and toss all the vegetables. Bake again for another 20 minutes until all the vegetables are tender. Serve with tzatziki or plain greek yogurt. 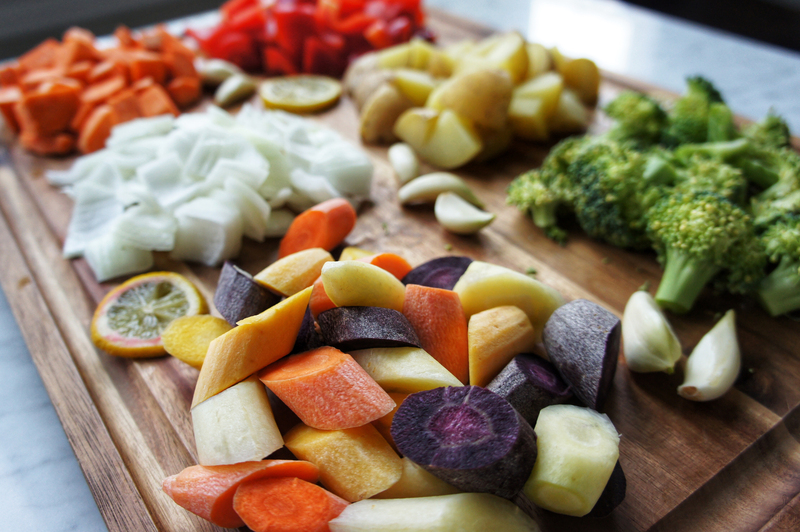 I love all the different colours, textures and flavours you’ve got with this mix of veggies. The colors are what make it look so good, and the flavors make it delicious!